It is so great to have Bree make a stop here at The Sweet Bookshelf on her blog tour! Let's give her a warm welcome and get to know her a little better. 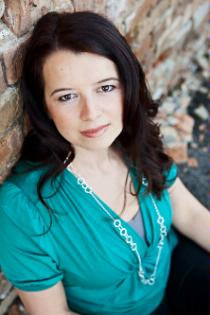 Let me introduce you to Bree Despain, author of The Dark Divine. Let's get this sweet party started!! expect from your debut novel? Romance, hot guys, intrigue, mystery, monsters, hot guys, kissing, an ancient curse, brotherly love/hate, redemption, fight scenes, . . . um, did I mention hot guys yet? What are the best and worst parts of writing your first novel? The best part was when things really started to come together for the story and I started getting feedback from my critique partners and mentors that my novel had the potential to make it all the way to being published. It was really thrilling to see how excited people got about the story and the writing. Self doubt is the hardest part. Even after hearing so much great feedback on the book, and even landing an agent for it, and then getting a publisher, there’s always that little voice in the back of my head that tries to tell me that my efforts still aren’t good enough. Learning to shut that voice off is something I think most writers/authors struggle with on a daily basis. What are some of your favorite books? Works of art? Artistic creations? I love Shakespeare plays, especially OTHELLO and MUCH ADO ABOUT NOTHING. My favorite YA novels are SPEAK by Laurie Halse Anderson, SWEETHEARTS by Sara Zarr, and PANTS ON FIRE by Meg Cabot. I also love TO KILL A MOCKINGBIRD by Harper Lee. I also love modern art running the gambit for Renoir’s DANCE IN THE TOWN all the way to Jackson Pollock’s LAVENDER MIST and SHE WOLF and pop art by Roy Lichtenstein. I would definitely say it’s all the awesome people I get to meet, from readers, bloggers, other author, and industry professionals. There are so many wonderful people I would have never met in a million years if it weren’t for my author career. Anything you'd like to say to The Sweet Bookshelf readers? Thanks so much for stopping by! And thanks to The Sweet Bookshelf for hosting me on my blog tour. I truly hope you all enjoy THE DARK DIVINE…and the hot guys in it! Thanks for stopping by Bree! We wish you all the best in your career, and can't wait to read what is next! Please go to Teens Read and Write, http://www.teensreadandwrite.com/ tomorrow to see the next stop on The Dark Divine Blog Tour. This was darling, darling! Great questions.